The Veteran, Delicious and I went to Stub & Herb’s Friday night to watch the Gophers hockey game and after the game a band set up and played–well, practiced, in the other room. They were too loud and not particularly good and not once while we were there did they play a whole song. Stub & Herb’s is a Uof M college student hangout and a sports bar near Dinkytown that has entirely too many Packers fans. 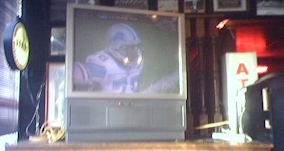 They have plenty of small screen TVs and two very underwhelming large-screen TVs for watching sports. Their food is decent and reasonably priced–the French dip sandwich is particularly good and their chilli is decent, as well. They ocassionally have live music, which is really unfortunate because the place is far too small for the too-loud garage bands that seems to be the only "talent" they employ. They have pool tables and they serve Summit Beer but they do not have wi-fi access. The place is owned by Sue Jeffers, who is running for Governor of Minnesota as an independent candidate because she’s pissed off about smoking bans. I really can’t blame her. 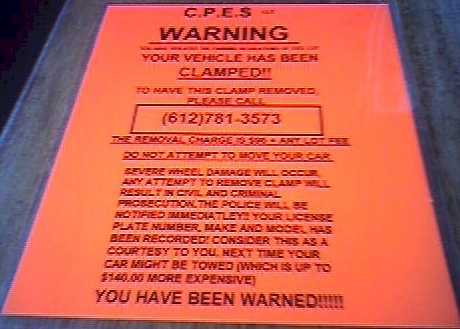 But getting my vehicle booted wasn’t the most interesting thing that happened that night. As we were watching the Packers game, a girl in the next booth started flirting and I’m game, of course, ’cause flirting’s fun. So it’s back and forth flirting here and there throughout the night but when it comes time to pay the bill and I’m digging in my wallet, she says something to the effect of "twenty-five bucks to look, fifty to touch." I was shocked. I was speechless. That was the last thing I expected because this cute young woman looked and acted nothing like what I imagined a prostitute to be. But, I guess, having no experience with them, I wouldn’t have known what to expect, anyway. Just so you know: Watch out for the boots and the hoes. Check out more cool places around the metro at my Twin Cities Bars, Restaurants & Entertainment Hotspots map.